Shopping in Myeongdong in the evening. 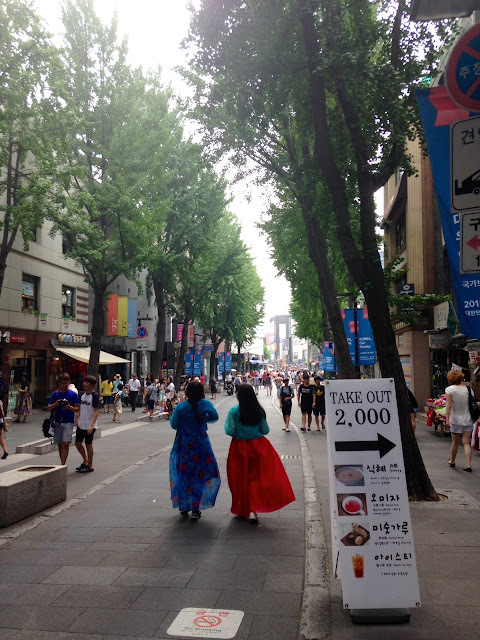 My two-night trip to Seoul was my first ever visit to South Korea, and I loved it! 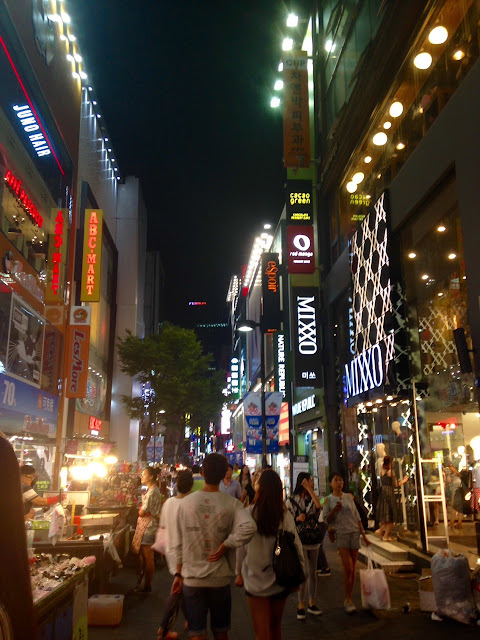 I stayed in Myeongdong and also visited Hongdae and Insadong, each of which focuses on different types of shopping. Certain things, though, such as the popular Korean beauty brands, are easily found in any of these areas. 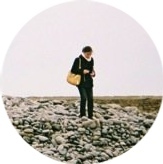 For today, my post focuses primarily on clothes, accessories, and souvenirs. I'll eventually post about my skincare and cosmetics purchases as well because, spoiler alert, I went a bit crazy with buying beauty products in Asia. Because I rarely shop for clothes in other Asian cities, largely because the styles are too different from what I'm used to, I was surprised to find that I greatly enjoyed browsing clothes at street vendors and small shops in Korea, mostly in Hongdae (the trendiest area I went to). The clothing styles that are popular in Seoul have a different feel from those at similar vendors in, say, Taiwan. It's hard to explain what I observed, but popular styles include both a minimalist-ish aesthetic as well as a different, more feminine look with some nice prints, but not too much in the way of frills or other embellishments. To try and illustrate what I mean, I might point you to Zipia, an online wholesaler selling Korean fashion, though I don't think their offerings are perfectly representative of what I was seeing. I've tried to find some Tumblrs that showcase Korean style, and this one seems alright. Quality-wise and production-wise, everything I saw was quite good for the price (better construction and materials than H&M or Loft for basic cotton or rayon items that cost about $11 USD each, with an occasional sale promotion driving the price down to around $6 USD). Everything was labeled "made in Korea." Given that I prioritize careful shopping and getting my money's worth from my purchases, I couldn't really justify thinking about the many fancier and more expensive pieces that were available. For instance, I saw one dress design that would have cost 44000 KRW or $37 USD, which I couldn't consider for an item that I couldn't try on. It wouldn't be that consistent with my current shopping philosophy to do that much shopping here, but if I came out on another trip, I'd like to browse more. Behind the cut, I've included more detailed descriptions of the different shopping areas I've visited and a few additional photos. The main shopping area is right in front of exit 5, 6, or 8 at the Myeongdong subway stop, and it's worth taking the time to walk around. Many Korean and foreign brands have shops in the area, including Uniqlo and Zara. Throughout the day, especially after sunset, street vendors selling clothes, souvenirs, and accessories set up shop throughout the area. There's also a lot of street food, which I enjoy. I thought this was the best area to buy beauty products from the major Korean brands, though almost everything can also be found in Hongdae, Insadong, or even the Lotte Mart at Seoul Station. Almost every big Korean beauty brand likely has multiple shops scattered throughout the major streets in Myeongdong, and they're all more closely packed together and thus, easier to find than some of the branches in Hongdae, which cover a more scattered area with more side streets and detours. I didn't explore the food options in Myeongdong much because I was a bit overwhelmed by the crowds and the language barrier. I did greatly enjoy the samgyetang at Yeongyang Center, a restaurant that was both very close to my hotel and seemed to attract many non-tourists despite being so close to the major shopping streets. Hongdae is probably the most hip or cool of the places I went, and I don't think that it is particularly touristy, especially when compared to Insadong or Myeongdong. 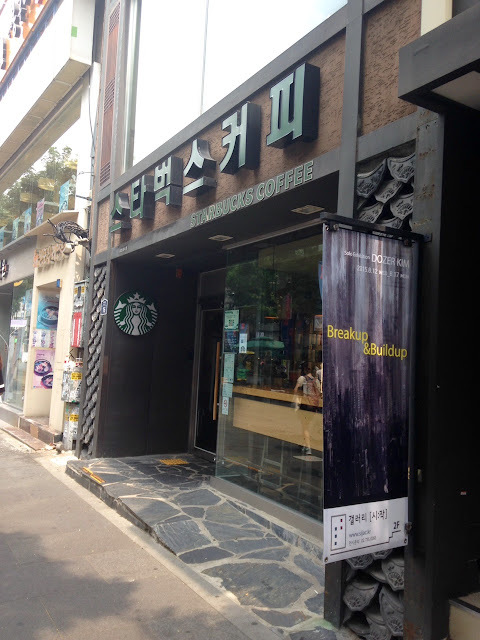 It's a shopping area near Hongsik University, and it seems to attract mainly local college students and teenagers. To get there, take exit 9 at the Hongsik University subway stop and follow the crowd. The streets there a bit windy and more difficult to navigate than the ones in Myeongdong. At least on Friday evenings, the area is extremely busy. Hongdae is a a particularly good place for buying cute home goods and accessories like the cat-themed coin purse and socks that I bought. 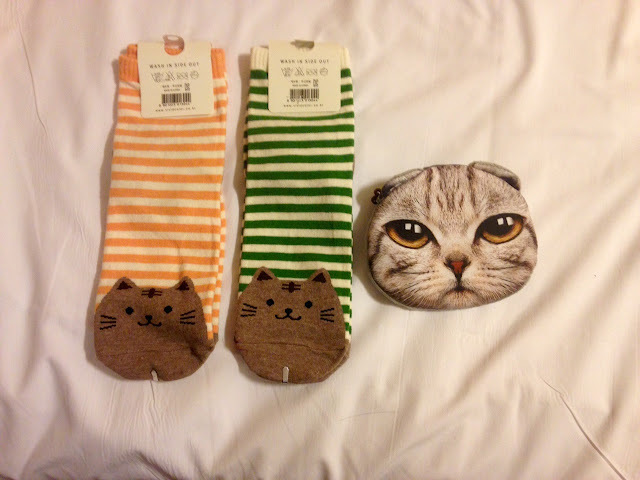 Korea is, incidentally, also the best place for buying extra-cute (but probably unlicensed) socks like the ones from my post describing the night market in Taichung. Because it is such a trendy area, Hongdae was also the best place to buy clothes of the type and price range that I described above. The offerings at the stores and vendors in Hongdae were more varied and generally more interesting than at similar places in Insadong or Myeongdong. The concentration of those types of vendors is also much higher. Because it was a holiday, there were stands allowing people to borrow Korean dresses or hanbok to wear for pictures and for walking around in Insadong. Insadong is a particularly good place for buying small souvenirs to serve as gifts. I bought many fancy cards with folded-paper hanbok on them and colorful fabric pouches to bring back with me as wrapping for the sheet masks I'll be using as gifts for my friends. To get to Insadong, I took exit 6 at the Anguk subway stop and followed the crowd again. Although I mainly shopped for souvenirs here, there are also some Korean beauty stores and clothing shops. As you walk south from Anguk station down the main street, you reach an area where chain stores like Starbucks, Etude House, or Innisfree have signage in Korean rather than English text, which I didn't see anywhere else in Seoul.